Often people know they may suffer from Anaphylasis or Anaphylactic Shock and carry medication in the form of an auto-injector. Ask the person if they are allergic to anything. 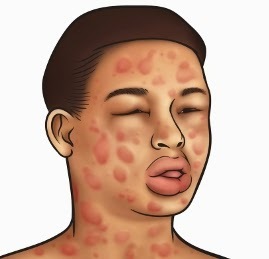 Anaphylaxis is an extreme allergic reaction to certain foods, insect stings or drugs, which results in rapid chemical changes in the body. The most common triggers are nuts, eggs, shellfish, pollen, dust, latex, certain medications, wasps and bee stings. Blood vessels dilate, producing red, blotchy skin. Air passages become constricted, resulting in breathing difficulties. Face and neck may swell. Heart, brain and lungs may suffer from a dramatic drop in oxygen supply. There may wheezing and gasping for air. Call 999. If the person is conscious and has medication (such as an auto-injector) help them to use it, if they unable to do it themselves and you have been trained, hold the auto-injector in your fist, and pull off the safety cap and press tip against their thigh through their clothing. This will automatically inject the person with the drug. Help the person to sit in an upright position that helps with breathing.